Glammed By Tarin: Trendy Tuesday!! It's 93 degrees out right now!! I cant not believe it. It has been a long time coming but the gorgeous warm weather is finally here and I'm enjoying every minute of it! Today is Trendy Tuesday at Christa Landmark Boutique! Today i got to pick out the look for trendy Tuesday and i love it! I personally own the Dress and shoes and they are amazing! Some of you have commented and ask about the shoes when i have worn them previously! Today these babies are 25 percent off along with the rest of the outfit!! 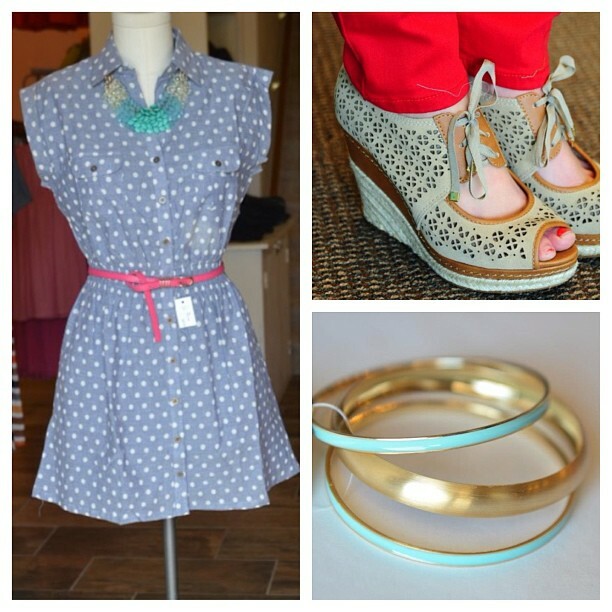 I have been on the market for a chambray dress for a while. As soon as i saw that we got this one in at the store i knew that it had to be mine!! I love how light weight it is, not to mention the polka dots!! We do ship so if you want to order any of these items just call the store at 320-269-8414. Hopefully you guys can get outside and enjoy the gorgeous weather!! Oh, now this dress, I love. And I think it's awesome you guys ship! How do the sizes run? I'm always having to try things on because of cuts and curves.